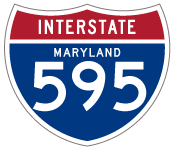 I-595 in Maryland is the longest unsigned route within the Interstate Highway System. Aligned entirely along U.S. 50 (John Hanson Highway) and partially along U.S. 301, the I-595 designation applies to the freeway between I-95/495 (Capital Beltway) and Maryland 70 at Annapolis. U.S. 50/301 extend east from the I-595 end point across the Severn River and Chesapeake Bay Bridge. 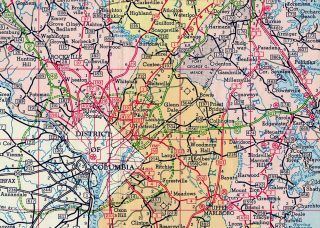 Maryland applied to AASHTO on November 15, 1975 to redesignate the U.S. 50 freeway between the Capital Beltway and a point west of Annapolis as Interstate 68. AASHTO instead opted to conditionally approve the western portion of the route as an extension of Interstate 97 and the eastern section as Interstate 197. Neither of these routes were signed and construction had yet taken place on I-97 northward when Maryland again applied to AASHTO on October 3, 1981 for the I-68 designation along U.S. 50. This application included a renumbering of the I-197 portion as Interstate 168 however. Finally on June 7, 1989, AASHTO approved renumbering U.S. 48 and the National Freeway in western Maryland as Interstate 68, with the former I-68 proposal along U.S. 50 and 301 reassigned as Interstate 595. Upon completion of the freeway upgrade in 1995, U.S. 50 was to be cosigned as Interstate 595. However since travelers were vastly familiar with the U.S. 50 and 301 designations, officials reconsidered signing I-595 and instead kept the designation hidden. Nonetheless, some signs for U.S. 50 installed in the early 1990s were designed with space reserved for the familiar tri-colored shield. 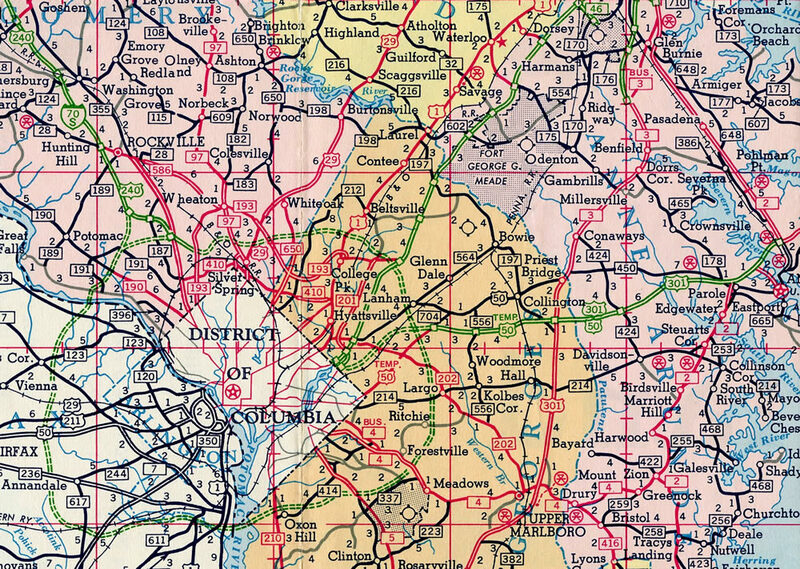 The I-595 portion of John Hanson Highway was open from MD 704 (Exit 8) eastward to MD 2 (Ritchie Highway) by 1957.2 The 1961 Maryland map shows an alignment shielded as Temp U.S. 50 using E Capitol Street, MD 704 and John Hanson Highway east to MD 3 and the merge with U.S. 301. U.S. 50 east & 301 north advance east from the merge with Maryland 2 (Exit 23) three quarters of a mile to Maryland 70 (Rowe Boulevard). The unsigned designation of Interstate 595 ends at the upcoming exchange (Exit 24). Photo taken 12/16/16. Spanning Weems Creek with five lanes, U.S. 50 & 301 continue a half mile to the parclo interchange (Exit 24) with Maryland 70. Maryland 70 constitutes a divided arterial southeast to Downtown Annapolis and the Maryland State House. Photo taken 12/16/16. A lane drop occurs along the freeway eastbound for Exit 24 to Maryland 70 (Rowe Boulevard). I-595 concludes here, with the Chesapeake Bay Bridge toll plaza located 7.2 miles ahead. Maryland 2 crosses the Severn River with U.S. 50-301 to Exit 27, where it turns north to Glen Burnie and Baltimore. Photo taken 12/16/16. Maryland 2 south combines with U.S. 50-301 ahead of the Severn River, one mile out from Maryland 70 (Rowe Boulevard) and the unsigned beginning of Interstate 595 west. Photo taken 12/31/16. The U.S. 50-301 freeway meets Maryland 70 (Rowe Boulevard) just outside the Annapolis city limits at the community of Weems Creek. Rowe Boulevard doubles as the 2.32 mile long Maryland 70 from College Avenue (Maryland 450) by the Maryland State House to Bestgate Road just north of Interstate 595 and U.S. 50-301. Photo taken 12/31/16. Bestgate Road parallels I-595 as it extends west from Maryland 70 and Rowe Boulevard to Westfield Annapolis Mall and Maryland 178 (Generals Highway). Photo taken 12/31/16. Exit 24A loops away from U.S. 50-301 west for MD 70 (Rowe Boulevard) south across Weems Creek. MD 2 splits with the freeway at the ensuing exit with Solomons Island Road. Unsigned I-595 commences and travels 2.1 miles west to partition with a lengthy off-ramp to Interstate 97 north. Photo taken 12/31/16. U.S. 50 (John Hanson Highway) runs along side the AMTRAK Northeast Corridor and MARC to a diamond interchange (Exit 5) with Maryland 410. Maryland 410 (East West Highway) stems north to Woodlawn as U.S. 50 continues east one mile to the Capital Beltway and the west end of unsigned Interstate 595. Photo taken 06/02/03. U.S. 50 eastbound expands to five lanes with two auxiliary lanes from the New Carrollton Station on-ramp to the turbine interchange (Exits 7A/B) with Interstates 95 & 495 (Capital Beltway). Exit numbers along Interstate 595 continue the numbering scheme of U.S. 50 east from the D.C. line. Photo taken 06/02/03. Guide signs installed during reconstruction of the former full cloverleaf interchange between U.S. 50 (Hanson Highway) and the Capital Beltway in the early 1990s included space allocated for I-595. The designation was never added, and most of these panels were eventually replaced. Photo taken 06/02/03. Exit 7 parts ways with U.S. 50 (Hanson Highway) east, carrying traffic to both I-95 & 495 south to Alexandria, Virginia and the beltway north to Greenbelt and Beltsville. Photo taken 06/02/03. “Interstate 595: Unfamiliar name, well-known pain.” The Sun (Baltimore, MD), May 31, 1993. Page updated September 6, 2017.